If it’s thrills you’re chasing then you’ll be in adventurous heaven on the Gold Coast! This sunny region has some of the country’s most amazing opportunities to push yourself to new extremes, whether you love height, speed or picking up new skills. Here’s our pick for the five most adventurous activities on the Gold Coast that are sure to have your heart racing. Sure, you can skydive in a lot of places around Australia but you won’t always have the chance to do it over picture-perfect beaches and skyscrapers that look like toys far below. It’s a breathtaking experience to land on a white-sanded beach after plunging through the air. There are several skydiving operators in and near the Gold Coast with excellent safety records to choose from. If you prefer to stay a little closer to the ground, that’s quite alright – you can get in on the action with an indoor sky diving session! 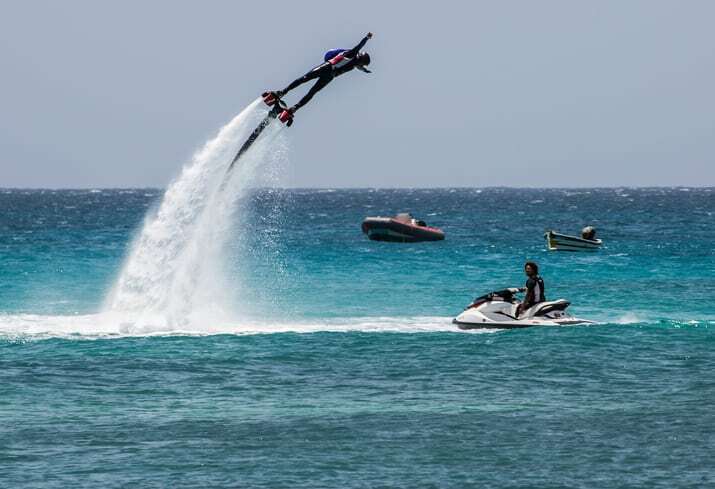 The Gold Coast is one of the few places in Australia where you can experience the amazing sensation of driving a jetpack, which enables you to cruise through the air thanks to powerful jet streams. Even a beginner session will have you dangling your legs metres above the water’s surface and looking like something out of the future. There’s also the option of a jetboard session, which places the power at your feet and the flexibility to learn some very cool air tricks. It’s almost impossible to pick the best theme park on the Gold Coast, but there are a couple of rides you can’t miss if you feel the need for speed. The Tower of Terror II at Dreamworld glides placidly through a tunnel before gathering speeds of up to 161km per hour in just seven seconds – oh, and it includes a 100-metre vertical drop on the way back down. If you’re a rollercoaster fan, then you can’t miss the new DC Rivals HyperCoaster at Warner Brothers Movie World. You’ll be screaming along at a blistering 115km per hour, with the choice to do the same while moving backwards along the track. There’s also a synced virtual reality option that will take you on a mad journey through Gotham City. There’s simply no better place to learn how to surf than in Surfers Paradise, where the water is warm and the swell is consistently good. The sport requires a mixture of timing, coordination and balance and your first lesson may feel slow to start with, but the first moment you actually stand and start carving up a wave can produce a truly unforgettable thrill. Once you have the hang of it, you may well become hooked for life. Once you’ve reached amazing speeds you’ll want to reach amazing heights too. SkyPoint Climb is the highest external building climb in Australia, taking you up to a dizzying 270 metres above the ground on the 25th tallest building in the world. You’ll have incredible panoramic views from the top as far as the eye can see, over pristine beaches and the Gold Coast Hinterland. If you dare, you can also make your way along the edge of the stairs with a sheer drop below. Our tip: book the twilight climb to experience the sun setting over the view of a lifetime. Searching for luxury suites on the Gold Coast close to all the action? Reserve stylish Broadbeach or Southport suites now.